In September 2017, a 20-tonne dead whale was buried on a beach at Port Macquarie on the New South Wales mid-north coast; a week later it was exhumed when locals became concerned the decomposing carcass would attract sharks. A research project completed in the two years since the incident has found those fears were largely unfounded. The study, carried out at Southern Cross University's National Marine Science Centre in Coffs Harbour, concludes that — when done correctly — burying whale carcasses on beaches will not attract sharks. Lead author of the study and Southern Cross University PhD student James Tucker said when he began his research two years ago, the belief was the opposite. "The public perception at the time was that whale carcasses — even when they were buried on beaches — would attract sharks," he said. "A lot of people said they would, a lot of people said they wouldn't, but it seems a majority, or at least the most vocal majority were saying that they would attract sharks and make beaches more dangerous effectively." The study, based on field trials using 360 kilograms of humpback whale flesh, found that the reach of decomposition plumes was less than 2.5 metres. "Provided that certain conditions are met, it's very unlikely that those decomposition plumes will reach the ocean, where they're available for sharks to sense," Mr Tucker said. Those conditions include ensuring the carcass burial site is above the groundwater table and high-tide mark. "We also found that [the plumes] don't last very long at all, so what we think is happening is that carcasses that are buried in the sand are pretty much mummifying, so we're not seeing much decomposition product come off those carcasses," Mr Tucker said. While the study found the risk of shark was minimal, it also acknowledged assumptions from the study site could not be generalised to all beaches — given conditions and groundwater presence can vary. For that reason, the study concludes that certain conditions should be met when considering burying whale carcasses. "The best thing to do is to have no water passing through — or a limited amount of water passing through — the burial site and bury the carcass far enough up the beach so that no very large spring tide is going to inundate it," Mr Tucker said. "It's likely that provided certain conditions are met, burial is a safe option." 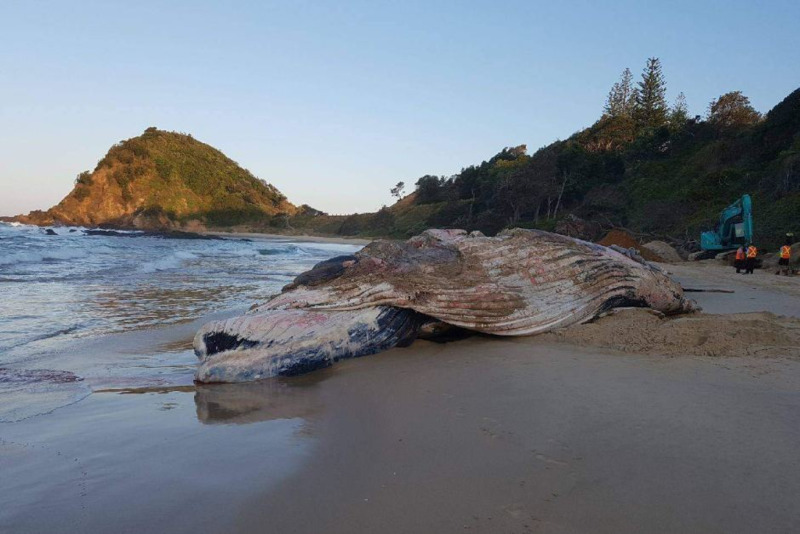 This whale was buried at Port Macquarie in 2017, before being exhumed a week later due to concerns it would attract sharks. Photo: NSW National Parks and Wildlife Service. There are no published best-practice guidelines on how to best deal with whale carcasses, but the Office of Environment and Heritage is reviewing its management practices, and the findings of this study are being taken into account. "The Government is considering the next steps in the review process; in the interim the National Parks and Wildlife Service [NPWS] has taken steps to improve the coordination of response to incidents," a NPWS spokesperson said. The review will also consider community concerns about shark attraction. The whale carcass burial and subsequent exhumation at Port Macquarie in 2017 was followed by a similar controversy less than a month later at South Ballina on the NSW north coast. 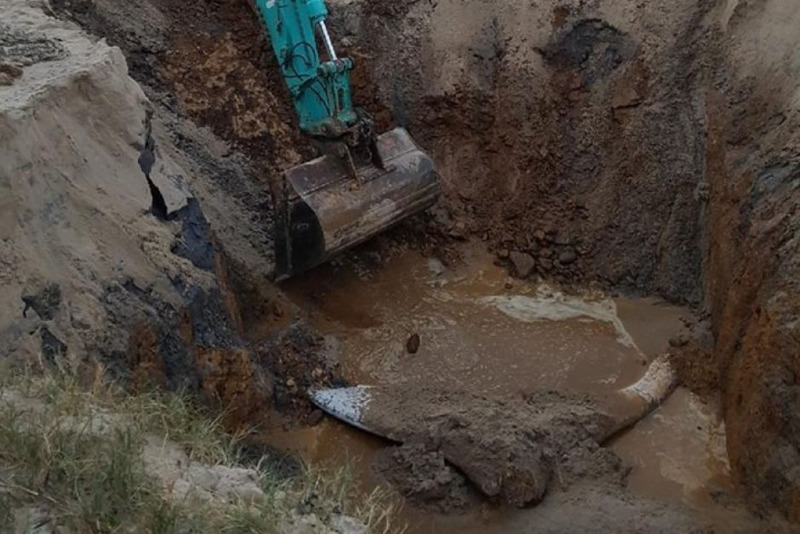 The Office of Environment and Heritage initially buried a dead baby humpback whale 150m from the shore, before a public outcry saw it dug up and moved to a waste management facility. Ballina Mayor David Wright said people had grave concerns at the time, given the area already had experienced an unprecedented string of shark attacks in the previous 30 months. He said despite the research, the public would take time to change its perception. "Just burying it [a whale] on the beach, I don't think is an acceptable thing to do these days," Councillor Wright said. He said that while the cost of moving a carcass was significant, it had to be weighed up against the cost of other factors, including loss of income for local businesses. "You've got to be very cautious; if you bury a whale on a beach, and people know that, they won't go to that beach," Councillor Wright said. "None of the tourist destinations want that to happen." Seems that the study's conclusion that "the reach of decomposition plumes was less than 2.5 metres" is highly conditional. Given many beaches are only slightly higher in elevation above sea level, the groundwater table would be only a small distance below the surface. I also wouldn't mind seeing the data that shows how far plumes travel after significant rainfall, or during groundwater recharge events (the impacts of which can be felt some distance from the recharge source). "pretty much mummifying..". The one at Kawana was bubbling!! And when did "pretty much.." become a scientific term? When you are speaking to a journalist and trying to make your research accessible to the general audience. and they used meat, rather than a whole carcass which has guts and other things in it... buried above the groundwater and tide line - so right up in the dunes? How do you avoid the water table at the Beach? I live 500m from the beach and my bore is only 4m deep. My first thoughts too. A lot of beaches don't have dune systems large enough to bury a carcass so deep that it wont be scavenged yet not hit the water table. I suggest every beach is unique. No prizes for guessing were we see the most shark activity/sightings/encounters. Even yesterday an aerial patrol buzzed the wave zone, 8-foot white shark, “pretty much” nose beering the “plume”. "Those conditions include ensuring the carcass burial site is above the groundwater table and high-tide mark." ...so no beach on the planet. 360kg of flesh is hardly close to a 30,000kg adult humpback full of gaseous decomposing organs. This study is trash, jog on. I smell the "Dilbert principle" at play here, all the public brouhaha about burying carcasses, government agency worries it may get a caning if they bury a carcass and a surfer get's mangled, slips funding to university, "hey throw a grad at this and come up with something to mitigate our risk exposure". The questions above really do raise questions about the methodology and results. I searched for the paper but was not able to find it. The accompanying photo of the Port Macquarie whale burial neatly puts the study’s reported results into context. That looks like a pretty wet hole, as you just about always get at the beach. Meanwhile over in the west our government doesnt even put the theory to the test. No risk takers in the dept. here- we just leave them to rot where they wash up. The record for longest left rotting is a whale that washed up dead near Yallingup in the states SW. It arrived in August 2018 and as the warning states every month the authorities are monitoring the situation. Nine months that piece of blubber has been leaching oils into the water. Would it be too simplistic to just burn the bloody things in situ, after all they are full of whale oil?? Further to the dead whale scenario is the fact that one washed up near North Point just before our new toothless Drum Line Trial commenced. The hook closest to the rotting blubber is catching the most sharks by far. No word yet on whether the same sharks (presumably tagged on capture and release) keep coming back to the same hook as that sort of info seems to be only for the fisho retreiving the sharks or the same people mentioned above who are monitoring the situation. Decomposing Whale Gas/Oil Fracking that we had to have! Who would've thunk it? Most Spit/Estuaries are Marine Parks or Saltwater/World/Surf heritage reserves/NP's. These "Dune Contact lakes" permeate Ocean Environment. *Turning WH reserves into Giant cemeteries will lose our standing in the World. *Contaminating Saltwater Peoples land all over again is unthinkable & not on! *Govts are closing Sand mining/Fuel reserves/Septic Tanks on Spits due to seepage. *It defies belief that a Whale would have less seepage than a septic tank. *Why do many councils first wrap the Whale & grave or both if it doesn't seep? All East Coast Lows & Cyclones plume both river & oceanside of Spits & estuaries. Breakthroughs & Dune erosion is uncontrollable. GCCC as others forever fight this! Climate scientists predict more Dune erosion is the norm. Inturn underscores the preserving of our precious fragile wonderous coastline. *Sea Storm Erosion has exposed several Whale carcasses from Sand Dune Burials. One could conclude that the burial weakened the dunes causing erosion. Prolonged beach closure due to destruction,reburial, rising cost kills town's standing. *Whale numbers are on the rise where our coastal resource is dwindling away. *With Spit Tip site stinking out the town...Where to now Millionaires Row? Gold Coast groundwater(Use is banned) to WSR as its permeated with GCA PFAS. Gold Coast Miami Servo groundwater fuel trail to oceanfall could be lit with a flame. *A whale carcass in sea surge could reverse back up the Town's Groundwater. Clearly shows how fouling one part contaminates the greater being. Fluro clipboard kidz piloted pet drones to dip toes in whale carcasses over 2 years? 'Big Mac' seeped from Rocks,Beach.Skips,Trucks,Tip,Sewer Plant down creek >SLSC. Let's see where the teacher ticks that off in the kid'z homework book. *March 2019 Canal Rocks Beach WA is still closed since Aug 2018 Whale stranding. *Whale carcass is quickly broken down at sea but takes forever on land. *Increased Rescue calls>GC Spit Plan shows no provision for SeaWorld rescue at all? tbb asks if all wounded marine life is to now be buried in such a way...Anyone? *Whether Whale carcass attracts sharks or not it's hardly a nod of approval. When does secret whale burial, permit Town ceremony of naming,grieving at grave. Does our town hide a Whale Tip or celebrate Whale tourism birth to headstones? Just waiting for someone to post the video of one getting blown up. Re water table. Is the high tide mark .......who the fool finds these people. Greenhorns , really dangerous study that provides minimal evidence. The most reassuring opinion was from the Ballina mayor . A practical solution even if it is business minded. You guys are a tough audience! Beaches and dune systems aren't uniform. My take is that the article simply points out that burying a whale carcass in part of the dune that is above the water table and beyond the reach of the tide won't attract sharks. Seems reasonable. There are lots of extensive sand plains/dune systems in northern NSW and SE Qld. There are much fewer sand plains south of the Hunter. To me, it seems reasonable that burying a whale carcass in a dune system back from the high tide is a reasonable proposition, and probably poses minimal risk in terms of attracting sharks. But that seems a very specific set of circumstances. And I wonder if many beachings will satisfy those criteria. At least it's attempting to put some rigor around the debate and that's got to be a good thing! Agree Dave. I think we should value the effort that has been made to address an issue that has caused concern. No- one here, to my knowledge, has actually read the paper so all opinion is based on less than complete knowledge of what was done. We need to recognise that our risk of shark attack is extremely small and many of the factors that influence it are poorly understood. If we want to improve our understanding we should support research in the area. If you want to make constructive criticism, then first read the actual paper. Criticism of complex scientific research based on nothing more than a brief summary is simply unfair. "While the study found the risk of shark was minimal, it also acknowledged assumptions from the study site could not be generalised to all beaches — given conditions and groundwater presence can vary." And that's the problem, one shoe doesn't fit all. Finally , we agree on something. Well put I d .
" study " actually working. *and maybe "... and weigh 350kg or less"
NSW Govt/SCU marine scientists argued against Qld/NSW Surfers request for nets. SCU science oddly reflects NSW Govt cutbacks prior to joint studies funding. QSLSC's & surfers affordably crowd a corner in State's South East. NSW surfers & SLSC's are expensive to run along an entire coastline. WR Govt/SLS Solution:WR Drone(fake)rescue & WR drone spots & retrieves bodies? Qld Shark nets affordably corner South East with drumlines dotted. NSW Shark attacks occur along whole surfing Coastline so nets are too expensive. WR Govt/SCU Solution: WR Drone Shark spotter trial scares off remaining Sharks. NSW Govt claims victory over sharks...No NSW Sharks > No costly shark nets. Qld Whale calves on suburban beaches are cheap to tip, others are freed from nets. NSW juvenile Whales to Adults beach on remote outcrops and expensive to remove. WR Govt solution: WR SCU Trial of Lump of inert high & dry stale Whale blubber. NSW Govt claims Beached Whale Condos now come with shark free wavepools. NSW Govt gets exactly what it paid for ahead of time every time. Ask the hired help! Poor cousin of Lib's Great Barrier Reef Foundation funding model. Still plenty of time for more NSW Govt' Seachange WR's...should make us feel safer! To say it has no affect is just a statement from someone that doesn’t ever go to the beach as sand will let decomposing leach into the environment much quicker than soil. Story is spoken by someone that never uses the beach. Link to the study? The research? Anyone ??? Curious as to how they incorporated groundwater and rain into the model as rain infiltrating the sand profile around the buried portion of whale would then migrate down to the groundwater. Also curious as to how the plume is being measured, chemical content? Which may not relate to odour. Burying whales above the groundwater table on the North Coast will be practically impossible with elevated perched groundwater tables in the coastal dunes and lack of access in the National Parks. Mind you, plenty of millionaire properties on the coastal dunes such as Blueys Beach where I wouldn't mind seeing them have a crack at dropping a whale in a backyard. Can anyone link the study? Can anyone also link the WA data where the North Point drumline is catching significantly more GWS with dead whale nearby, in comparison with other drumlines? Would be nice to juxtapose both sets of data. Unknown species, 3m caught, tagged, released. Womb surf break. thanks for the update I hadn't seen that one on the sharksmart website. Unknown species is code for the GWS is it? Well I don’t think they would be tagging 3m shovel nose, looks better in the reports if they leave out the words Great White, and keeps the sea Shepard driving thirsty petrol land cruiser crew quieter. I’m sure it would be more than one if it were commission incentive to actually catch a white pointer. there was a decent write up about the accuracy and speed of update on various reporting platforms. SharkSmart are slow, Dorsal are slower.. with the fastest updates coming from Surf Life Saving WA's twitter account. You can chuck the doi into scihub and get the whole thing. The science seems sound for these set of conditions, but the conditions are a really big issue. In the SWWA there are some stretches with dunal systems (e.g. Booj, Boranup) but many others (where most recent whale carcasses have washed up) have low sandy beaches close to groundwater table and then large limestone cliffs. As many have pointed out impossible to bury below the GW table. I would have thought that this would be a constraint for the majority of cases Australian-wide. Mummification process would also depend on local temperature and rainfall patterns. Anyone notice in the photo above that the carcass is being exhumed from within the groundwater table? Yep! Basher posted an interesting article about Maori chopping up the whales , cleaning up the bones, and burying the meat and guts and bones separately. They take the blubber away to melt down, and come back and get the bones once they are cleaned up. Presumably chopping up a whale means the hole is smaller and more shallow that they bury them? Keeping them above the ground water? A decomposing whale on the beach doesn't just feed sharks, think about everything from beach worms, crabs, small fish, birds that get a good meal out of it. It seems a shame to take all that perfectly good meat and cart it off to be wasted in landfill. I certainly make the effort to throw left over fish frames back into the water either next fishing trip or at least take them down to the river ( just don't do this for imported fish, could spread disease - I'm talking about fish i've caught myself). Left exposed to rot there wouldn't be much other than bones left within a few months anyway. If you bury it you get accused of hiding it, just leave it out for all to see and smell and let nature take it's course. Tow the freakin' carcass out to sea, for f'k sake!!! Otherwise I agree with previous posts about setting fire to it...marshmallows, anyone? Time to debunk the NSW boffins. 2015 NSW Govt launched Sharksmart App hand in hand with SCU + WA. Simply check phone alarm for how many & what distance the sharks frequent. This being a real time full sized evidence based tally...far superior than one site. Ask! Why NSW Govt / SCU aren't sharing innovative Sharksmart data with public? Let's ask now! Where is Sharksmart beached & buried Whale carcass data? Forgive if a private app supplies that data to users already. Is it possible NSW / Uni never liked that answer? WR study uses a 1% fillet off a Whale...No blood & guts or acidic ballooning organs. Seemingly dumbing down any viable data either way. This a WR that no one wants? Whales beach larger in size as they tire on return trip south. Sand dunes are Highest at newborn's Bay then diminish southbound. Meaning small calves beach on high sand dunes as to larger Whales on small dunes. tbb reckons diminishing resource alone debunks experiment as waste of money. Smaller creatures lost in a desert (vs) Larger creatures share Golf Course bunkers. Humpback Whales are 20ft high & 30 ft across + Tails are 5.5m wide. WA Govt say buried Whale carcass forever rises to surface before it's use by date. SCU say to bury carcass (2.5m minium) above high tide + allow for Storm surges. Burial Dunes would need to measure at least 40-50 ft as a starting height. That is only the middle height as most ocean side sand dunes whip into peaks. This is not allowing for 100 x the whale fluids as to SCU 1% breast fillet sample. tbb reckons a sand dune of 80 ft may buy SCU enough time to pack their bags! How would machinery climb elevated dunes with weight within safety parameters. tbb doesn't say that lightly as cable snap near took a blokes head off last year. tbb explained mostly weak or attacked 'calves' beach on steep Sandy Straits dunes. QLD whiteshoes could relocate Kgari south to SCU HQ for a carton of piss. Designer Whale Deaths to suit Oz Coastlines. tbb alerted that Oz #1 Rescuers are booted out of GC Spit Master Plan. Our GC ocean rescue unit has no Harness,winches or barges. So where to now? Do we next see chopping & dicing of Whales to fit each Town's sand dune. Govt funded WR Dr Moreau samples his Raw Prawns from atop town's Whale tip. Jap Whale retrieval wins hands down on enviro & humane front. Please come back! Ok that's great news for the small number of whales taken off beaches and buried away from the water table a distance away from the high tide mark. The issue is the already buried whales over the years which are on beaches or foredunes or simply inaccessible carcasses left to rot on beaches. These do attract sharks. As I've said in previous articles, a whale was buried at Cottesloe beach in the early 90's. 2 fatal attacks there. The 15 tonne whale that washed up at Wedge Island was there for 2 years with loads of smaller sharks in the shallows there the entire time before it finally washed away broke up where the debris ended up where a surfer was killed a few years later. So many other whale carcasses where sharks are almost guaranteed to be seen nearby. This research is extremely flawed. This research is probably good for 5% if whale incidents only good for councils to go by if the set of circumstances are followed to a tee. Hey Scoopmaster, you should put your fish frames on the barbie instead of throwing away. That's the t'bone meat of the fish! A marine biologist once told me that after the initial couple of days (or something) a buried whale carcass posed no treat and would not attract sharks. It was something to do with how different species like to eat their kill/meat at different stages of death. Some predators want it alive or relatively fresh, whereas others are happy to eat it later very dead and decomposing. Anyway his theory was that a shark doesn’t want really old decomposing stuff. Made sense at the time, but having said that I’m happy for the carcass to be dragged way out to sea as suggested above. The saltwater Croc is known for the death role, put the prey under a rock or stag, & come back for a feed later, decomposing . There is utube footage of great white sharks eating dead whales decomposing . I’m pretty sure that sharks are circling & if they are hungry they will feed! Well the two that have washed up / been dragged into yuragir nat. park near angas in the last three years weren't buried at all, just left to rot on the beach. No mummification going on there. The orange oil stain from the leeching spread nearly 50mtrs in each direction across the sand, which a wee bit more than 2.5mtrs. Ummm? In English not Gaelic please. Yerp, it's my local, I'm a blessed man. I'm just pointing out I'm ALOT more cautious around there having seen the decomposition process first hand. It's going to take a truckload of scientific evidence for me to believe that sharks wouldn't be drawn to whats parked up on the beach. Agree Brus. First time I surfed it, on my own, the thoughts that go through your mind. Lol & it took a French Brazilian women to show me that part of the world. tbb salutes insightful comments on hot topic. As always fellow swellnetonians speaking their mind & questioning the science. SCU/Govt Sharksmart obviously "bleeps" the sharks spooking full size Whale Burials. Ding Ding! Roll out another NSW Govt WR. Whale Fillet test was to sanction portion sizes for stakeholder's standard sand dunes. If each Dune crumbs a whale Fillet then it's scientifically sound not to attract sharks. Adult Humpback requires 70 standard sand dune graves...one for each Whale fillet. SCU WR test shows 10 average NSW beachings requires 700- 800 Sand dunes/yr. NSW could redirect border bypass sand back south for extra SCU Whale Grave Plots. Robs Superbank & frees up Qld southern point breaks...tbb can be blinded by science! At what point will they stop protecting the great whites. The pelagic’s aren’t protected and some ocean areas are reputedly over fished. The apex predator gets hungry, and now there’s a lot more of them. Surely at some point they should stop being protected? I have no beef with the sharks, it’s their backyard, if they arrive on land & start eating us humans. The old saying is Protect yourself at All times.